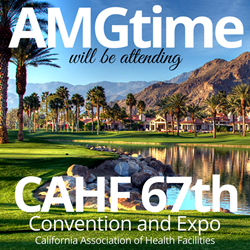 AMGtime will be showcasing time and attendance solutions for health facilities at the CAHF convention & expo being held in Palm Springs, CA from November 13-14. AMGtime will be returning to CAHF’s annual convention and expo at the Renaissance Palm Springs and Palm Springs Convention Center on November 13-14. At booth 525, AMGtime will spotlight their time and attendance solutions including biometric hardware devices, cloud and PC-based software, mobile apps, seamless integrations and much more. AMGtime offers many specialized industry solutions. For example, health facilities specialized in skilled nursing will benefit from AMGtime's PBJ and NHPPD module, which will help automate calculations for census and nursing hours per patient day. AMGtime is excited to announce the most recent updates to their already robust time and attendance system. The GPS Workforce Tracking module allows employers to track employees’ GPS movements when they are clocked in using AMGtime's mobile apps. AMGtime has also configured a solution to convert HandPunch time clocks into wireless and real-time devices. The last addition that AMGtime will be discussing is their Advanced Scheduling Module that will be released sometime in Q4’2017. AMGtime is one of many great vendors showcasing innovative solutions at the annual conference held by California Association of Health Facilities. They have been organizing CAHF expositions for 67 years, and continue to succeed in gathering healthcare services and organizations, vendors, and attendees. This event not only gives attendees an opportunity to meet with companies like AMGtime, they can also participate in industry updates, solution showcases, breakout sessions, and more. Visit AMGtime to learn more about recent updates for workforce management in healthcare services, and see their variety of biometric devices displayed. While you are there, don't forget to play a guesstimating game to win an Amazon Echo Dot, and collect your sticker for the Flamingo bingo game. With 24 years of experience, Los Angeles-based AMGtime has made its mark as a national leader in providing time and attendance solutions. AMGtime provides easy to use and flexible time and attendance products and services, including software available on both the cloud and PC, top of the line biometric hardware, mobile applications, specialized industry solutions, and much more. AMGtime’s solutions are customizable and adaptable for basic to complex configurations, simple to implement, and affordable, providing organizations with the highest level of efficiency and ROI.